Last week I picked up this little step stool for $4 while out thrifting. It came with a wire wrapped around it in several places. It was pretty grubby. After I cut the wire off, I did see a pretty good sized crack in one of the legs. My husband thought it should have went straight to the garbage, and was not worth fixing. I glued the leg and clamped it to dry. It cleaned up really well with a little Pine-Sol in water. I also used a Mr. Clean Magic Eraser to get some of the grime off. 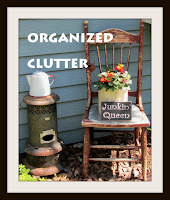 I really do like junk, but I am always a little squeamish about the "ick" factor with junk. It stays outside until I can scrub it up good. I'm not sure where it will end up for sure. Maybe on a laundry room wall? Maybe outside with flower pots? It will never again be used as a step stool, as it's really pretty rickety. It will definitely be part of my decor. Love the look of this stool! I'm sure you will find it a great place to live and be useful and decorative! Oh it is so cute Carlene! Glad you kept it. Oh those husbands. I hear the same thing! What do you want with that!! See! It just goes to show how little guys know about the treasures we find. Your step ladder cleaned up nicely and looks perfect just where it is! Hang it on the wall and use it for towels and aprons! I love the red paint showing through. Maybe you should put a note on it so someone won't try to stand on it. It's perfect right there. Glad you kept the chippy and didn't try to pretty it up! Love it!! I really like how the red shows thru it. It looks lovely to me and I'm glad you rescued it! You've also reminded me that I have a little rescued step stool under my deck that I forgot about! Maybe I should give it another look! I love this stool... what a great find! The red showing through the chippy white is perfect and goes great with all your plaid! Sure cleaned up nicely Carlene ... some people just cannot see beyond all the dirt. Looks cute where it is. I think you cleaned this little guy up well. I can see the ick factor concern. It came out great and you can't even notice the leg was cracked. Love it! Do you know, when I was in H.S. we cheered with little white step stools like this! You reminded me! Love it. Silly husbands what do they know?